In real life, she is sitting on the sofa in the bay window of her San Francisco assisted-living facility. Next to her, Dr. Sonya Kim gently tugs the straps that anchor the headset over her eyes. 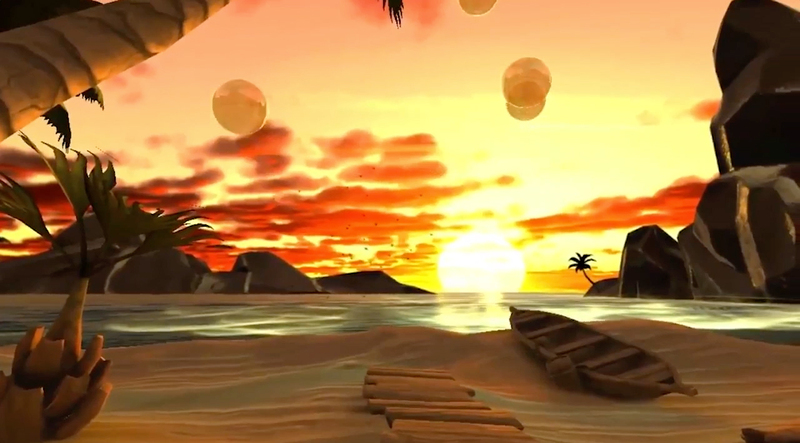 But in the virtual world, Anderlini is on a Hawaiian beach, and it’s sunset, and she is surrounded by a glistening sea and a molten purple-red sky. If she looks up, she sees the fronds of an enormous palm tree, and falling rainbow specks that dance in the air like the light from a disco ball. “In the back, look at this,” she continues, wriggling around to see the imaginary world behind her. “Terry, you’ve got to see this, too!” she calls to her son, who is watching nearby. 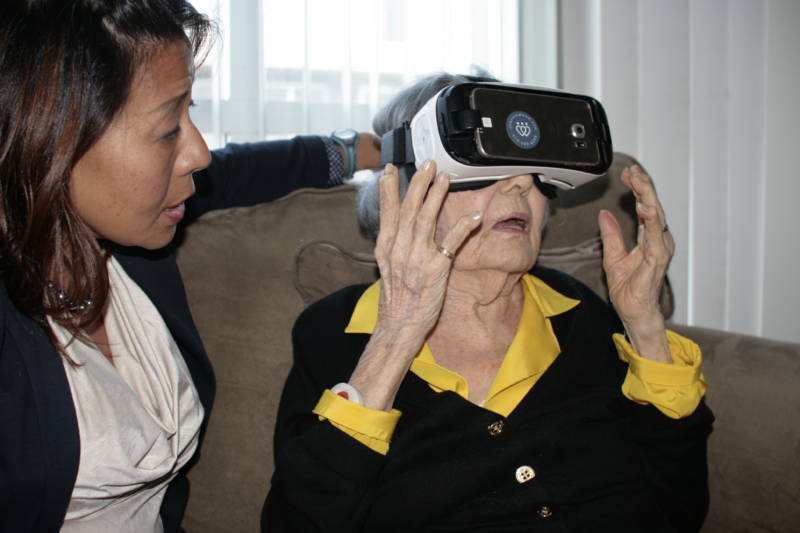 For a Bay Area virtual reality entrepreneur, Kim has an unusual target audience: the elderly. Anderlini is the first private client for Kim’s Aloha VR program, which Kim envisions as a way to help people relax, an alternative to endlessly watching TV, and a change of scenery for those who can’t get out much. Kim, a former emergency room doctor, found her way to virtual reality through a series of tough requests. A few years ago, she was running a house-call practice when she received a call for help from a woman whose 88-year-old mother had stopped eating and drinking. As a result, she’d made three emergency room trips in a month, racking up more than $50,000 in medical bills. That interaction led Kim to found One Caring Team, a care call program, in 2014. Staffers phone seniors at home to check on their mood, medications and appointments, and prompt them to chat about positive subjects, like what makes them happy or what they could do bring joy to someone else. By chance, Kim had been reading about virtual reality and decided to attend a VR mixer in San Francisco; someone let her use an Oculus headset to walk through a virtual garden, and she “totally fell in love” with the medium. Convinced her seniors would like it, she borrowed a friend’s headset and took it to a preventative care conference. By the time she was done, she already had assisted-living facility directors asking about pricing. That convinced her the concept could sell, but she wanted to make sure VR could actually make people feel better. For example, in the 1990s, pioneering researchers at the University of Washington developed SnowWorld, an icy virtual environment that reduced pain for burn victims during wound treatment. More recently, Dr. Albert Rizzo’s lab at the University of Southern California has helped military veterans with Post Traumatic Stress Disorder by offering exposure therapy in virtual environments. The Veterans United Foundation has created virtual reality experiences of veterans' memorials, for vets who can't travel to see them. And scientists at the Chronic Pain Research Institute have tested a Virtual Meditative Walk meant to help users manage pain and stress. VR is typically formulated for younger users, and often asks them to play games, solve puzzles, master new information and move around energetically. But many of Kim’s clients are wheelchair-bound; those with advanced dementia cannot read or follow verbal commands. Nearly all of them are unfamiliar with the conventions of VR, which assume that the user knows to swivel their head to take in the 360-degree view, to move around to make the landscape scroll, or to tap objects to interact with them. Instead, many of Kim’s clients go through entire sessions seated, heads cast down, hands folded in their laps. Sometimes her staff has to gently pivot a client’s chin to help them look to the side. But exploration and beating puzzles aren’t the point of this kind of VR: The environments have no storyline, just scenery. The name Aloha VR is a nod to Kim’s time working in a Hawaiian ER, where she came to admire the state’s ‘ohana spirit, a concept that encompasses love for extended family and respect for elders. In the version Anderlini is watching, Kim’s voice offers a friendly welcome and reminds her to take her medication to stay healthy. As she speaks, the text pops up in little orange bubbles that burst pleasingly at the end of each sentence. 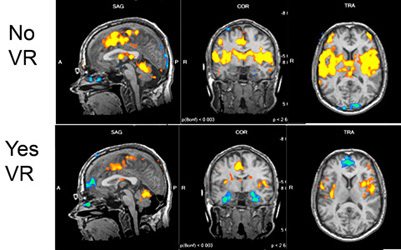 Versions for the cognitively impaired have no words at all, just music and the sounds of waves. “If there’s too many words, if there are too many things we’re asking, they’re going to get frustrated,” said Kim. In addition to having private clients, Kim conducts group therapy sessions at Bay Area assisted-living centers, where a dozen or so people take turns with the goggles. Although some of her clients struggle with verbal communication, they seem to have found other ways to express enjoyment. One client, Kim said, simply blew kisses. Another hummed happily. A third stole 40 minutes in the headset, repeatedly asking for “Just a little more, hon.” A few of them just go to sleep. There are still challenges for the company to work out. The headsets can be heavy, it can take seniors a while to warm up to trying them, and while prices for mobile VR equipment have come down, it still costs about $850 for each Samsung Gear VR headset plus the Galaxy smartphone that slides into it—enough that they don’t have a rig for each client. So far, Virginia Anderlini has been on virtual visits to Venice and Africa, and after her brief trip to the beach, spends some time in an autumn-themed meditation session watching leaves fall. But she’s seen it before, and soon asks for something different. What virtual world would she like to try next? “Just something I haven't seen before,” she says.